Vichai Srivaddhanaprabha died along with four others when his helicopter plummeted into a car park outside the King Power stadium. CLAUDIO RANIERI REVEALED on Monday he had been “terribly shaken” by the death of Leicester City boss Vichai Srivaddhanaprabha. Ranieri, 66, was hired by Vichai in 2015 and led Leicester to their historic Premier League title success the following year. Billionaire Vichai, 60, died along with four others when his helicopter plummeted into a car park outside the King Power stadium shortly after his side’s 1-1 draw with West Ham on Saturday. “I was terribly shaken by the news,” Ranieri told Sky Sport Italia in his first public reaction since the tragedy. He was a good man and always had a positive word for everyone. His positivity and ability to make everybody love him was clear for all to see. He came into the locker room only to dispense kind words, never to reproach you. Ranieri said it was now up to Vichai’s son “who has always been in love with football” to carry on in his father’s footsteps. He recalled his first meeting with Vichai. “I immediately thought he was a positive person, full of energy. My objective when I arrived at Leicester was to secure Premier League safety, then we all know what happened. Vichai Srivaddhanaprabha made a very important contribution to the Premier League victory, as he’d arrive 30 minutes before the game to embrace everyone. He never said a word out of turn, was always happy with a smile on his face. 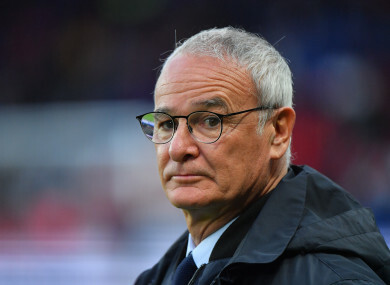 After Ranieri was sacked by Leicester in February 2017 he took charge of French Ligue 1 side Nantes for the 2017-2018 season. Email “Ranieri 'shaken' by death of Leicester's Thai boss”. Feedback on “Ranieri 'shaken' by death of Leicester's Thai boss”.